Here's an interesting article on CNN about faith, religion and physicians. Today we celebrated Carter's Adoption Day. It was last year on this day, September 26, 2007, that we went to the Montgomery County Courthouse, appeared before a judge and signed the legal documents to become Carter's parents, officially and forever. We're so grateful for the gift that God has given to us in Carter. We reflected back on God's grace in our lives through his adoption story. In addition to his obsession with cars (and wheels and keys) Carter loves trains. So we thought we would celebrate Adoption Day by taking him on his first train ride. 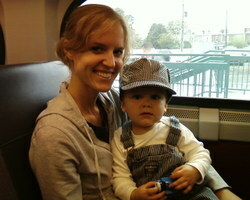 We dressed him in his conductor outfit, brought along his Thomas the Train toy and heard him say "CHOO CHOO!" dozens of times. We got off at Market Street East terminal and went to Reading Terminal Market, had a cheese steak and a soft pretzel and then rode home. We are so grateful for God's faithfulness and His blessings through the miracle of adoption. Easum states leaders should think and act like spiritual midwives. Recently I finished a book by Frank Viola that just came out called Reimagining Church. It was his follow up book to Pagan Christianity, which caused quite a stir in some circles. I'm glad that the author followed up with this new book. It's much more hope-filled than Pagan. As Frank admits, Pagan Christianity is incomplete without Reimagining Church. (Check out Frank's blog and the website). Viola has some good thoughts and discusses how we can understand and live out first-century Christianity as the Body in much simple forms. It's well researched and lays a good biblical foundation for organic forms of church. This was good timing for us as we develop house churches at Renew. He challenges your thoughts in several places (and probably over-emphasizes some things at a few places) but you can tell he is passionate about rethinking church and articulating the potential of making the invisible kingdom visible through the ekklesia. I don't agree with every single thing he wrote in the book, but it still is worth picking up and reading. It will challenge your understanding of church and help you think through what it means to be a biblically functioning faith community. Author and church consultant Bill Easum wrote an interesting column in the September/October issue of Rev. Magazine about the difference between good leading and great leading. Good leaders are born good leaders, but great leaders are shaped in the trenches. Good leaders work with the cards they are dealt. Great leaders challenge the prevailing rules about how to conduct ministry. They are never content with the status quo and always have a holy discontent about the way things are. They know that man-made rules are made to be broken because there's always a better way. Good leaders make sense of the moment, but are often too busy. Great leaders read the signs of the times. Great leaders are willing to "ready, fire, aim" while good leaders always want to have everything in place before they fire. Great leaders are always laying it on the line, stepping out where most people fear to go. Good leaders delegate ministry to others. Great leaders empower others. Good leaders accomplish more. Great leaders Great leaders know their success doesn't depend on them but on how they inspire others to achieve. Great leaders define leadership differently than good leaders: Leadership isn't about getting people to do what you want them to do, but is helping people achieve what God created them to be and do. Good leaders act as players. Great leaders act more as scouts and coaches. Great leaders surround themselves with good leaders, while good leaders surround themselves with people of lesser skills. The line between good and great leading is thin and dynamic. I have a lot to learn from what Easum wrote. Authors always enjoy hearing how their books are impacting people's lives. I received this email from a pastor-friend of mine from Australia. Strangest thing happened to me Yesterday. I had a meeting with someone who grew up in the church but left when they were 16 and are now 24. She wanted to talk to me cause they came along to church and really felt that God spoke to them through me and that she wanted to come back to church. I asked her what prompted this return to church and i got the surprise of a lifetime "I picked up this book in the bargain bin called 'When God says Jump' and it really struck me and convicted me, so i decided to come to church" meanwhile i am sitting there dumb founded and speechless and then she says "have you heard of the book?" to which i explained our little story and praised God for his sense of humour. Renew: "When are you starting?" It seems that every few days I get this question: When are you starting Renew? The short answer is: we already have. But the answer is a little more involved that that. Over the summer, we prayed diligently and met with many people who felt a similar call to the vision of Renew. In June, we had informational meetings at our house. We communicated the vision, prayed together, answered questions and explained that we were putting together a launch team for this new faith community. I shared that the launch team would be the backbone of our leadership and the team would help determine and shape together what Renew will look like. We communicated un-apologetically the high level of involvement to which the launch team would be held accountable. These commitments are grace-filled, but would involve servanthood and sacrifice from the very beginning. For a few months after these informational meetings we sat down with each person and talked about motivations, expectations, commitment levels and availability to serve. In those conversations we determined together if we felt this to be a good fit for them on the team. In August we began meeting officially as a launch team and have been meeting weekly since then. We've made the decision that for the next several months we will meet with just our launch team on Sunday mornings in order to pray, prepare, share our stories and our lives with one another, learn what "church" really could mean (as well as unlearn some cultural understandings of what "church" is), begin fleshing out the gospel right now in our context in smaller, less official, more informal ways (especially Monday through Saturday) and discern what kind of faith community God's spirit desires for us to become. The truth is there is way too much to do...so the best thing we can think of to do right now is to slow the process down. It's freeing and take the pressure off when we slow things down and just "be" together. It's funny how people have misunderstood this. There are some fun rumors swirling out there, too. A few people who have heard such false rumors have said: "So, I hear you are interviewing people and deciding if you will allow them to attend your church or not? Isn't that a bit legalistic and judgmental? It sounds like you guys are a cult." I said that if we did that, it certainly would be judgmental of us, but that's not what we're doing. (And we're not making human sacrifices over an open fire at our meetings either if anybody was wondering!) We're simply wanting to know who is with us fully and building on that team from there. We're not trying to build a church where you're only allowed in if you have the secret handshake or dress with the right color shirt. We're carefully seeing how God has brought to us so we can pray and plan and discuss and discern together before we go public. When I explain this to individuals they always respond by saying that they think this is the right move. All this to say, we're intentionally slowing things down for now. Church planters will tell you that the development of a new church start is similar to a fetus developing in the womb. The development of a fetus takes a full nine months before birth. Usually nine months is a good time frame for a church to develop from conception to birth as well. And it seems that is about the time frame we believe we need to be on before we publically launch. We feel the urgency to start - the need is great! - but we also need to exercise discipline to move in the unforced rhythms of grace of this new God-driven vision. We probably won't launch Renew with our "official" open-to-the-public Sunday service until - at least - early 2009. And even that date we are uncertain of. As we believe God has called us to be a mission-driven faith communion, we desire to see Spirit-driven benchmarks of our DNA being embedded and fleshed out in smaller informal ways throughout our weeks before we have a "service" on a Sunday. Many have said, "Why wait? If the momentum is here, capitalize!" Well, we probably could do that, but we feel that would be a bit short-sighted. We believe that right now Renew is "wet cement." This is a significant time to intentionally embed the DNA into what we are doing because we desire for Renew to start - and continue - to be healthy many years down the road. It helps us put down deeper roots. It also helps us to focus on the non-Sunday morning elements of being Christ's Body, which is a good thing. We also need to unlearn some things about what it means to be the Body, and that will take some time. And, by slowing the momentum down it probably helps to keep people from making a reactionary decision to join us because they think we are the next "cool, hip church" to hit town, which we don't want to be. It certainly is a balance, one where we need to be very disciplined. We need to have what John Ortberg calls "restful urgency." Some of those smaller informal ways of engagement, involvement and connection have already started, as the lauch team has already begun asking questions of the community, listening to the needs and serving Lansdale and its people. We've connected - and will continue to connect - with people and organizations like Manna on Main, Community Housing, the police department, the Boys and Girls Club and others. Some of these places we've already started serving. We will be starting more smaller opportunities to be involved in Renew this fall. We truly believe that we can cultivate healthy expressions of the kingdom, not by growing bigger, but by intentionally becoming smaller. We will be starting house churches, smaller missional Jesus communities connected to Renew, this fall. These house churches will be a signifcant portion of what we do, meeting throughout the week and are open to everyone - those not on the launch team, and not just for those who are followers of Jesus. In fact, we have one rule: no perfect people allowed. When these are up and rolling and then when we decide to have a Sunday open-to-the-public service it will simply be an extension of what our mission already is, rather than a Sunday event that everything else revolves around. Again, the goal is that we undertand the Way of Jesus as a lifestyle we live out daily and not an event, location or service we show up at once a week. This is different for many people and will take time to develop. House churches will be for anyone desiring and yearning for life-giving connection with God and others in smaller, safer, more intimate settings. We feel this is important to start house churches first before starting a Sunday service. If our house churches can be cultivated over the next several months and they become healthy enough to honor Jesus, be honest and broken with one another, serve others, have a heart for the lost and begin to multiply - all this before a Sunday service - then we will be on track. We're extremely enthusiatic about these house churches starting and feel that the long-term approach is the wisest thing to do right now. (If you're interested in knowing more about house churches or want to be a part of Renew through these house churches contact me via email). As you can see, we've already started, but in smaller, less formal expressions - and not in a public Sunday service-type way yet. We'll get there - and that is important - but not yet for us right now. We're attempting to take the long-term approach. We invite you to pray for us in these significant months of praying and planning, serving and discerning what God's Spirit desires for Renew. I want to say a special thank you to all of you who have - or currently are - prayerfully and financially supporting my family and the Renew vision. We have people supporting us significantly and some supporting us $10 a month. Donors in Lansdale. People several states away. People across the country. Even donors in England and Australia. Thank you! We're grateful for your generosity and humbled that you are enthusiastically supporting the vision of this new faith community - to see people come to know Jesus. We are thanking God today for your role in our lives and how the vision is being lived out by your generosity. Hulu: a website that allows you to legally watch movies and episodes of your favorite shows for free. Seriously. Check it out. Gmail: if you don't have it yet, get it. Google continues to rule the world. Also, check out personalized google homepages at iGoogle. Rob Bell's newest book. It looks interesting. Persecution.com - a great way to be aware of and pray for our persecuted brothers and sisters around the world. (Also check out Tears of the Oppressed and Cry Indonesia). You love Moleskine notebooks? You love the Bible? Now they are combined. Check out the TNIV Noteworthy edition of the New Testament. This looks fantastic. Lark News: A Christian version of The Onion (only for those Christians who don't take themselves too seriously). Pastor, speaker and author Eugene Peterson has been a mentor to me for the past six years. Eugene and I have had a pen pal relationship, exchanging letters every few weeks as I ask him questions about life, God, faith, ministry and church. Each letter back from him is like Christmas morning. They are true gifts, very precious to me. He has shaped my understanding of true pastoral ministry and leadership like nobody else and I am humbled to be able to call him a friend and mentor. Eugene and I have talked often about Renew and what it means to be a Jesus community and what it means for me to pastor of a counter-cultural, hope-filled Jesus community. I have thought often that I would love for Eugene to be with us and speak to us, challenging and encouraging us with sage advice as to what he would want us to know, to do, as we start this faith community. Since he can’t come and physically be with us in person I wondered if we could have the next best thing. Two weeks ago I read that letter to our team. It was such an honor to read these words from such a wise pastor, who has shepherded, taught, prayed and led others in the ways of Jesus much longer than I have been alive. As I read it out loud I was overwhelmed and got choked up, aware of what a gift this letter is and will continue to be for our faith community. “...I have a strong conviction that one of the primary responsibilities of the pastors is to use language that is appropriate to living the gospel relationally on the ground, locally, in place with the people you are living and working with... The most conspicuous ways in which the gospel is communicated is by preaching (kerygma) and teaching (didache). They are essential. But pastor and congregation train one another in using a much more relational and personal, informal and unstudied language as we work wit people primarily not to proclaim or teach them about God but ot get it into their everyday, around the house, around the workplace lives. I call this language paracletic (from Paraclete, the Holy Spirit). It gets its content from preaching and teaching, but it gets its tone and syntax from this local and relational setting and encounter. This is the language of conversation - not telling people the truth of God and not explaining the things of God, but letting those languages be translated into the vernacular of our ordinary lives when we are not preaching and not teaching. Which is the way we use language most of the time and most naturally. And the only way you can do that is with people whose names you know and whose stories you know. This is what is unique about the pastoral vocation. And this is the great opportunity of a newly developing church. You can preach from the pulpit and teach from the lectern but when you walk into the church parking lot or stand in the checkout line at Wal-Mart you are using the language of the Word made Flesh in the places where people spend most of their time, where you spend most of your time.